Socialization isn't just an idea, it is a form of bias perception. In the article "The Cycle of Socialization", Bobbie Harro explains that we are born into a specific set of social identities and that they predispose us to unequal roles in the system of oppression. "We are then socialized by powerful sources in our worlds to play the roles prescribed by an inequitable social system" (Harro, 3). The first step of socialization is the beginning, where our identities are given to us at birth with no decision, choice, or effort from us. Our beginning stages of life are outside of our control. We fall into two groups: dominant (agent) groups or subordinate (target) groups. The next step is first Socialization, we are socialized by the people we love and trust the most from birth. Then there is Institutional and Cultural Socialization when we start participating in school, church, sports, work, etc. and the rules and roles of socialization are taught to us from someone other than the people closest to us. The fourth stage Enforcements occurs when you either do something right or wrong, you could be penalized or rewarded. The following stage results happens after the past stages. You either become the person society wants you to be or the person you were meant to be. The final stage of socialization is, direction for change. Direction for change is what you are going to break this idea or cycle of socialization. This cycle is proven through multiple generations and people such as Oxina Milaya, a girl who didn’t grow up by human societal norms. The mask project is the study of socialization and how it has affected our life, and the society surrounding it. The essay is the actual study of socialization. In the essay we talk about the different ways we have been socialized throughout our lives. 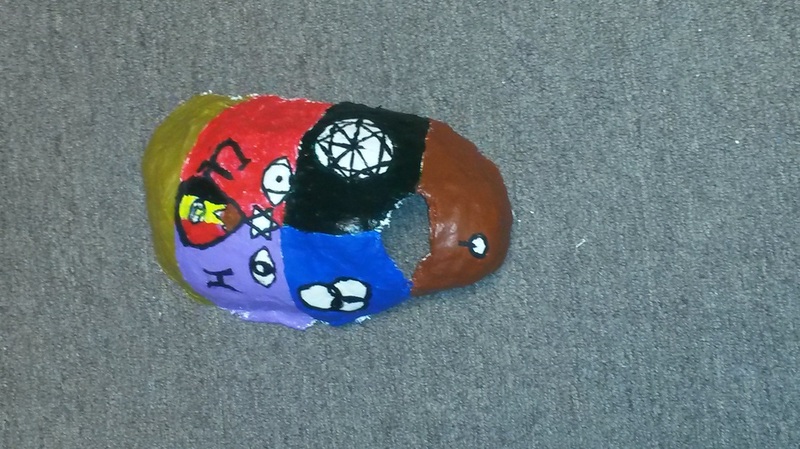 The mask was created to have a visual representation of the ways we have been socialized and how we showed that is up to us. These first 2 months of my time at animas I am proud to be on student council, getting outstanding grades and my mask project. My first two accomplishments are self explanatory but my third one isn't. I am proud of my mask essay because of the composition of the piece. This is my first essay at animas ergo I had a desire for it to be the best. “Being in the upper class I am not judged by the number of times I succeed, but by the number of times I fail.” This quote summarizes the pressure put on the “upper class” because of socialization. Being privileged has its perks, but it is also like being trapped under ice, having to prove yourself is like having to break through the ice to get a breath. Each individual is dealt a different set of cards in life, and socialization only amplifies our differences, and allows hasty judgments to be made purely due to privilege or lack there of. Overall, I have personally been and continue to be profiled by my social class, and it is simply unjust. My first experience being socialized negatively was by a former teacher named Mrs. Coleman. At the time, our class was planning a trip to Crow Canyon. The cost of the trip was $150, and during that time period, my parents were getting a divorce and I didn't want to bother them with the fee, so I proceeded to sell chocolate bars amongst my classmates to raise funds for the trip. Mrs Coleman was running the fund raiser, and one day while talking she asked,”Why do you need to sell chocolate bars to pay for this trip? your parents are doctors...” At that moment I realized that she was judging me based on what she had heard about my lifestyle; she didn't even bother to take other factors into consideration before judging me. This tacked on my first layer of ice. Being my earliest exposure to socialization, this has affected me forever. I proceeded to ask 100 kids about their experiences with socialization, 67% said that they have been judged by an educator due to their social class. In short, my teacher, Mrs Coleman, made me aware of the bitter act of socialization from an early age, this still causes me to question my own standings as well as my faith in humanity. Recently, I have been negatively socialized by people I dont even know, I often hear people talking about how I am a “spoiled rich kid”simply because of how I am perceived. This socialization shows me how numbed people are to reality, and how they let their own assumptions and their own way of life dictate their perception of others. Assumptions rarely ever come from past experiences, they mostly come from media, personal interaction, and hearsay as well as and books. "wow. you live on that side of town, you must be one of the rich kids... I hate you because of it" (urban dictionary) This is what many people have learned to believe, so they will continue to use this way of thinking until they break the cycle. “My goal is to be myself, and to challenge stereotypes, and to follow the rules, and break them, and make new rules. It's not about doing something that's already been done. That would be silly.” (Sasha Grey, Brainyquote) Even though the “upper-class” has its advantages, it also comes with being negatively socialized by all of the other classes. Over the span of my life I have found this to be true due to rumors and stereotypes about me. Trapping me under layers of ice even while most aren’t even aware. I have been socialized negatively in the past and still continue to be according to my class. Obviously socialization takes effect in everyones life from day one.